ible identify the dead. For the accomplishment of the work, the services of Moses Poffinberger and Aaron Good, Esq'rs., citizens of Sharpsburg, and gentlemen well acquainted with the battle-fields, were engaged. They visited every trench and grave herein described, and from their field notes this Descriptive List has been compiled, and published by direction of His Excellency, ODEN BOWIE, Governor of Maryland. 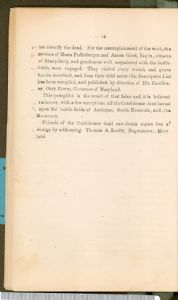 This pamphlet is the result of that labor and it is believed embraces, with a few exceptions, all the Confederate dead buried upon the battle fields of Antietam, South Mountain, and the Monocacy. Friends of the Confederate dead can obtain copies free of charge by addressing Thomas A. Boullt, Hagerstown, Maryland.